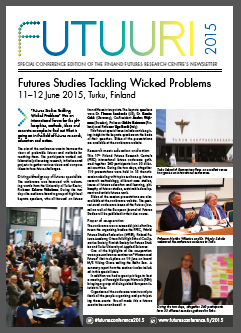 “Futures Studies Tackling Wicked Problems” is an international forum for the philosophies, methods, ideas and concrete examples to find out what is going on in the field of futures research, education and action. The aim is to harness the views of preferable futures and methods for reaching them. The participants in the conference will work collaboratively discussing research, initiatives and projects to gather various views and compose ideas to face future challenges. The conference will consist of keynote lectures, parallel sessions and participatory workshops. Our aim is to generate multidisciplinary, lively and productive discussions, as well as promote networking among participants from different backgrounds. In this conference the tradition meets new ways of participation: academia meeting activism and experience meeting enthusiasm. We look forward to seeing you in Turku this summer, June 2015! a pioneer of futures research and founding member of the Finland Futures Research Centre. This is the 17th International Futures Conference organised by the Finland Futures Research Centre and the Finland Futures Academy. It is organised in co-operation with World Futures Studies Federation, Otava Folk High School Co-Operative Society, The Finnish Society for Futures Studies and Turku University of Applied Sciences.